While I do enjoy studying Chinese words using Anki, I must admit it can feel like a chore much of the time. I tend to aggressively focus on challenging words, which often means that my queue for the day is filled up to the daily limit, and also that I’ve given myself a challenging workout. 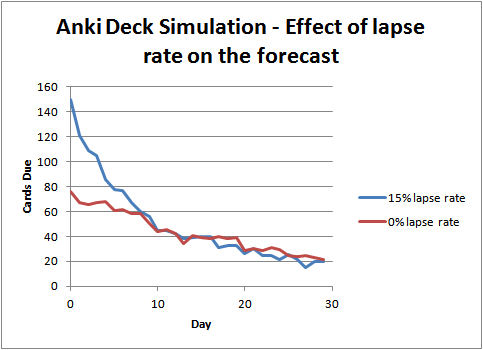 My usual habit at the beginning of a session is to check Anki’s forecast graph to check, even though I had a lot to study today, when my diligence will pay off. It is a real encouragement to see how great the future looks. While I have 99 cards to study today, all I have to do is study hard for about a week, and the number of cards due will be down by half. The graph continues to indicate reductions in the number of cards day by day, leveling off after two weeks to about 25 cards per day. I can imagine how awesome my study routine will be two weeks from now, when the spaced repetition algorithm will just require me to pull up Anki a few minutes a day of flashcards to in order to retain learned material. The next day when I fire up Anki, I still have a lot of cards due. That’s alright, because I knew I had a few days before the daily load started it’s decrease. It’s still about two weeks before the magic leveling off of 25 cards. I did have a few lapsed reviews during the session, which probably explains it. A week later, I’m still waiting for the promise of a smaller daily schedule. The graph below is my forecast a week after the first graph. Not only does the forecast look no better than it did a week earlier, but the number of cards due tomorrow is 35% more than it was a week ago! After two more weeks, I’m looking forward to the green pasture of 25 reviews a day. But wait, what’s this? What the…?? So after three weeks of studying daily, my daily queue has gone down from 99 cards, to … 90! What is going on with the forecast graph, and why is it so far from reality? Actually, the forecast graph is doing just what it was programmed to do. When it claims that I will have 99 cards to study tomorrow, it is entirely correct. Where it starts to go off the rails is in all the days after tomorrow. The counts for those days do not account for the cards I will study tommorow which will end up as lapsed. 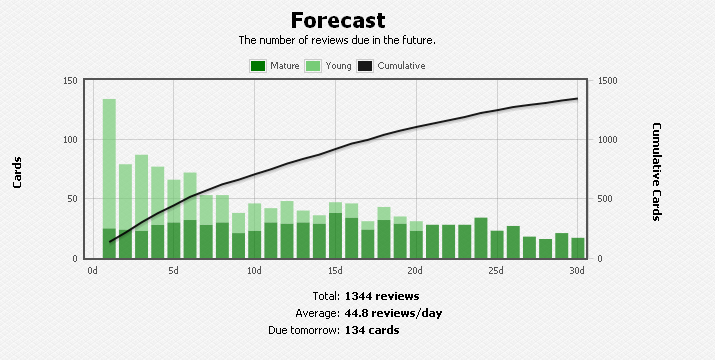 Cards that lapse tomorrow will be rescheduled on day 2, increasing the actual number of reviews from what the graph shows. It also doesn’t account for all the successful reviews tomorrow, which will all be rescheduled sometime further in the future, with some of them being within the 30-day window of the graph. All of these rescheduled cards will add to the original forecast in those future days. In other words, the forecast graph isn’t really meant to be a “forecast” of the number of cards you are likely to study. The graph is really just showing the number of cards due on each day in the future, as of this date. In fact, the source code for the graph uses terms like Due, IsDue, etc., for it’s functions, never referring to it as a forecast. A real forecast would be much more complex, and would need to run projections on probable number of successful and failed cards for each day in the future to adjust the daily counts. That would be a pretty cool feature, but isn’t what the software currently does. What about my experience of doing daily reviews, yet not making clear progress in lower my daily queue? Can this all be from a small number failed reviews? Anki has a graph that directly shows the propabilities for success and failure for a particular deck, or for all decks. This is the “Answer Buttons” graph (“The number of times your have pressed each button”). This charts the number of times each answer button (1=Lapsed, 2=Hard, 3=Good, 4=Easy) was pressed for different types of cards. Ignoring the blue Learning section on the left (which just indicates how many items you already knew), the Young and Mature areas of the graph indicate how well you knew items as they were reviewed. The Young subchart represents items that were last reviewed 21 days ago or less, while the Mature chart on the right side represents cards that were last seen over 21 days ago. The Young subchart includes some items that are difficult to remember and are repeatedly forgotten, so the average Answer Buttons tend to look less favorable compared to the Mature subchart. Mature cards have all been seen and answered successfully many times in a row, so the Mature subchart is more representative of the overall success rate of the deck. The Anki documentation suggests that the success rate (buttons 2 through 4) should typically be around 90%. 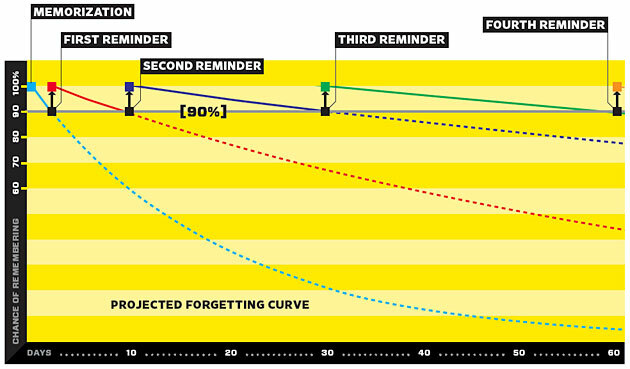 In fact, the SRS algorithm is constructed by default to aim for this level of performance, based on the model of memory where the chance of forgetting a fact increases over time. If you wanted a higher percent of success in your SRS sessions, you would need a more aggressive daily schedule because you would be reviewing items more frequently. If you wanted a more relaxed schedule, you would be doing less reviews but would have more lapses. The various algorithms in SuperMemo allow fine tuning of many scheduling factors based on empirical data from past reviews. Anki allows a small amount of control via the Interval Modifier deck option. I have 100 cards due today. After my review session, I have successfully remembered 90 of them but forgot 10. These forgotten cards are repeatedly shown until I remember them, at which point they will be rescheduled for tomorrow. Before my review session today, there were 90 cards due tomorrow. After my session, there are now 90+10 or 100! The next day, the situations looks slightly better. While I still have 100 cards to review, there are only 80 cards the following day instead of 90. I am likely to have around 10 lapses again (note that, except for yesterday’s lapses, these are all a different set of items than yesterday, so the chance of forgetting is the same). Thus, on day 2 I will have 90 reviews instead of just 80. In addition to the lapses, the 10 cards that were lapsed on day 0 and successful on day 1 will be rescheduled for day 2, 4, or 5, depending on how easy I marked the card. The graph above conveniently combines two different but important data sets: the forecast as of day 0 of the simulation and the actual reviews on each day. The bottom area in blue is the number of cards due on future days as of day 0. Thus, it is equivalent to the forecast graph in Anki. You can see that the number of reviews quickly drops, reaching 20 reviews or below as of day 26. The combined area of all three data sets represents the number of items that were actually reviewed on each day. It is the combination of the original forecast plus any items reviewed from day 0 through day N-1 that were rescheduled. The items that were successfully reviewed and rescheduled again during the 30 day window is a minor contribution. The major contributor to the daily queue is clearly from lapsed cards. It’s such a major factor that as of day 25, the majority of reviews are coming from items that had lapsed in the previous 24 days. It’s like slow, rolling wave of forgetting. What does it look like with a success rate better than 85% — say 90, 95, or even 100%? It’s hard to do a direct comparison because other factors come into play. While a lower rate of lapses obviously will lower the number of rescheduled reviews with all other factors being equal, a deck with fewer lapses will already have fewer scheduled cards on any given day. The graph below simulates forecast atarting from day 105, in a deck made by the addition of 20 cards a day for 100 days, followed by another 5 days of reviews with no further additions. In a deck with a 15% lapse rate, the number of cards due tomorrow is around 140, which in a deck with a 0% lapse rate, there are 80 cards due tomorrow. Two interesting observations are that the forecasts in both decks level off to 25 cards a day after about 3 weeks, and that the forecasts for both are equal after about 8 days. The dramatic difference is that the high-lapse case promises a quick drop in the number of reviews to reach that point. As we now know, that promise is not fulfilled. If the prospect of a small number of reviews in the near future keeps you motivated to keep up with your flashcard study, don’t let this analysis discourage you! But if you find yourself repeatedly surprised by how your daily reviews are higher than Anki’s rosy forecast, know that you’re not doing anything wrong. Just keep plugging away. 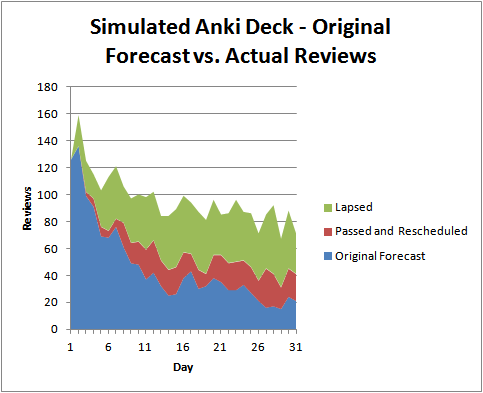 Your daily reviews will slowly but steady decrease over time, just not nearly as quickly as Anki’s forecast would have you believe. The HSK is a well-known skill level test used by the PRC to assess language proficiency in Chinese. Even for those who have no interest in taking the HSK test, the lists of Chinese words associated with the test are a convenient source of material for learners to study vocabulary. I have used these word lists myself with great success; it was a quick and effective way to gain a huge amount of usable vocabulary. In 2010, the HSK exam underwent a major reworking, changing the structure of its skill ranks, increasing emphasis on speaking and writing, and revising its vocabulary. Where the “old” pre-2010 word lists consisted of 8,000+ words across 4 levels, the “new” HSK has 5,000 words distributed into 6 levels. Below is a summary of the word counts in the old and new vocabulary lists, based on actual word lists obtained from various sources (see footnotes for details). Note that these include a small amount of double counting (less than 2%) due to words repeated at more than one level, because of either different pronunciation or meaning. 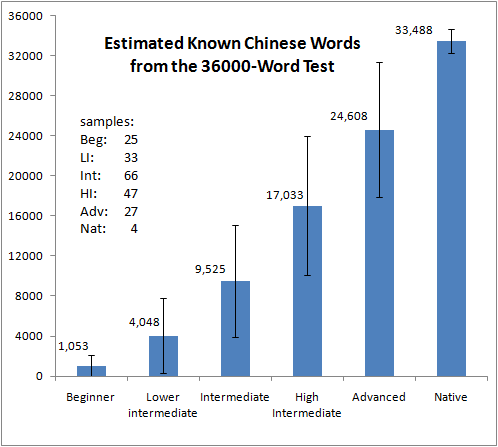 Also note that these counts differ slightly from the official word counts reported by Hanban. Since I had invested so much time in studying the old lists (up to level 3), it was natural to wonder whether I should continue studying my existing flashcards or switch to the new HSK lists. How many words have I learned that are deprecated by the HSK, and does it mean they are unimportant? If I did switch, what level should I pick to start studying ? Since starting Chinese, my studies have been mainly on developing reading ability. Not being in China or having regular language partners, my main window into China has been through text, so it made sense to take that approach. But more and more, I feel I’m missing out on enjoying all the audio and video content out there, which is easily accessible these days over the internet. I do occasionally listen to spoken Chinese for study purposes, but I have made very little progress in that area. At the beginning of this year, I changed my study ritual to focus much more on developing listening skills. In this post, I’ll share my experience thus far and various other thoughts. Please remember that this is just sharing my own experience and, as with any advice on language learning, your mileage will definitely vary! I have started to analyze some of the results from the word test experiment. While I continue to crank through the data, here is an early result that I found interesting. What this shows is the estimated word count, as extrapolated from the tested samples of each test, of over 200 trials, grouped by self-reported skill level and fit to a Gaussian distribution. The bar height is the mean value for the estimated known words, and the error bars are +/-1 standard deviation for the Gaussian distribution. Yes, that’s quite a large deviation, and it’s not surprising given the many sources of variability in the data: sampling error in individual trials by using 165 samples out of 36,000; self-reporting skill level in one of 6 categories — beginning to advanced and native — with the meaning of the categories undefined; and individual choice of what it means to “know” a word. This is all in addition to the natural distribution of skill within one of the 6 defined categories. Also, keep in mind that +/-1 standard deviation is only about 68% of the data. Thus, while the graph makes a nice linear progression by advancing skill level, the results are probably fuzzier than they look. Despite the overlap in known words for each skill category, there are clear definite realms for each level. If you score 7,000 words on the test, you would be similar in knowledge to others in either the lower intermediate or the intermediate level, but you definitely know more than most beginners, and less than most high intermediate or advanced learners. So, this chart may be useful if you’ve gotten a word score from the test, and want to find out if you’re at the skill level you thought you were. Of course, there is much more to language skill than the the number of isolated words you know. Ultimately, the only person you have to satisfy is yourself. What makes a good vocabulary list?